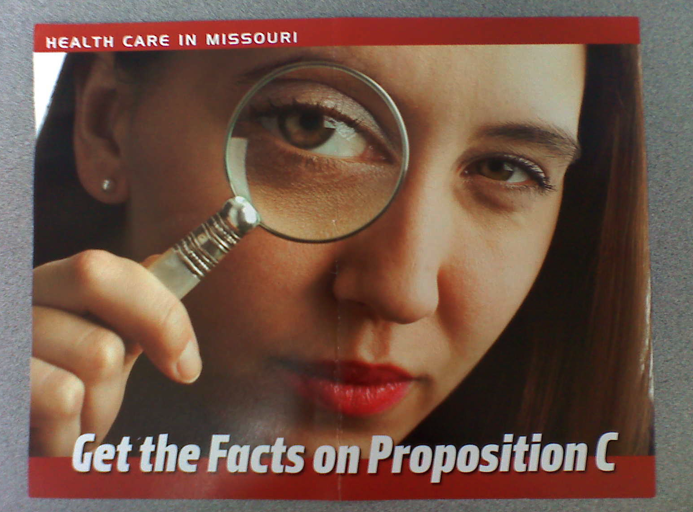 MO Hospital Association Attacking Patients’ Choice? But … I thought the left was ALL ABOUT choice? Those who wish to eliminate your ability to privacy in the doctor’s office, freedom over your own body, and penalize you if you wish to seek better care than the government will give you want to keep you from voting for Prop C. They’ve gone so far as to tamper with the ballots. Already. Sigh. 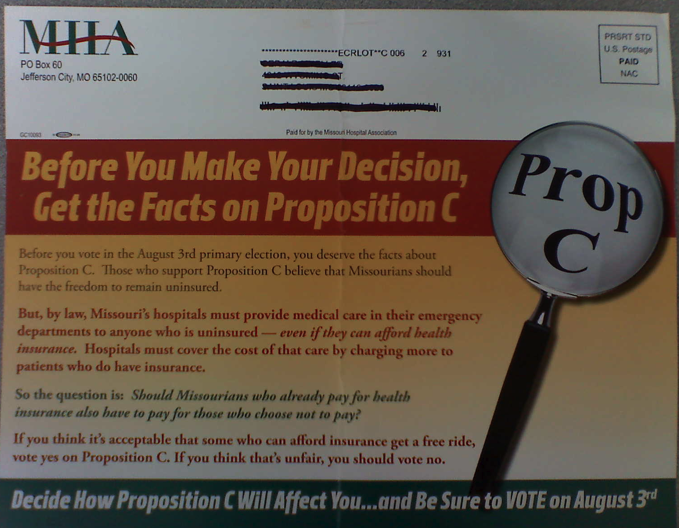 These mailings are from the Missouri Hospitals Association. Is the MHA shipping literature to hospitals and their employees as well? I must admit, even though I am a trained attorney, I have not read the whole thing, but I did read the provisions regarding enforcement. The IRS enforces the individual mandate of Obamacare. This means the only court in this country where Americans are presumed guilty will decide whether one has adequate insurance, and if you do not (according to the IRS), expect fines, penalties and harassment from Big Brother. This is why I support Prop C. It lays a duty on our elected state officials to defend Missourians from arbitrary and capricious decisions made in Washington. It also prevents Washington from co-opting state resources to enforce a program where no one is really sure how it will work. Neither one of the reasons behind my support for Prop C would violate the “supremacy clause” of the Constitution, backed up by constitutional jurisprudence. In fact, suggesting that Prop C would waste state resources because Obamacare is clearly constitutional reeks of journalistic laziness. The mailings are amusing – so NOW they’re concerned about cost? They weren’t concerned when the IRS said they lacked the funds to implement it. Isn’t it the socialists who say that conservatives make everything about cost? The mailing propaganda is invalid because it presupposes (while its colleagues simultaneously make the argument that only the rich are for Prop C) that those opposing health control aren’t willing to pay their own way. Those against Prop C ignore this fact, conveniently, while suppressing the fact that individual rights would be abridged concerning medical choices and choices over your body, period. The language asserts that people are getting “a free ride,” which is exactly the motivation fueling support for Obamacare in the first place – except it’s NOT a free ride, it’s largely unfunded with the tab being sent to the public, small business, and the rest of the cost-cutting occurring by way of rationing. If the MHA was seriously concerned about people getting “a free ride” they would have opposed Obamacare outright; but that they’re now selectively and illogically trying to enact this defense now simply shows absurd hypocrisy. The MHA is concerned about that but NOT about the lack of funding (all linked above), the rationing, the fact that we were lied to and told children would be covered and in fact they are not; the fact that businesses are dropping plans left and right to comply and cut costs; that despite promises, employees WON’T get to keep their plans; it’s endless. The bottom line is that opposition to Prop C is fueled by the desire to eliminate individual choice and freedom concerning YOUR medical choices. Equality is the same opportunity for everyone, equality is not using government to deny opportunity for all and giving everyone equally sub-par coverage. Prop C gives Missourians TRUE CHOICE over their bodies and their medical care, away from government rationing. It will set a precedence which scares those who wish to assume control by limiting your rights. Vote Prop C on August 3rd. This entry was posted in Big government, Civil Rights, missouri, Obamanation, Socialists by Dana Loesch. Bookmark the permalink.